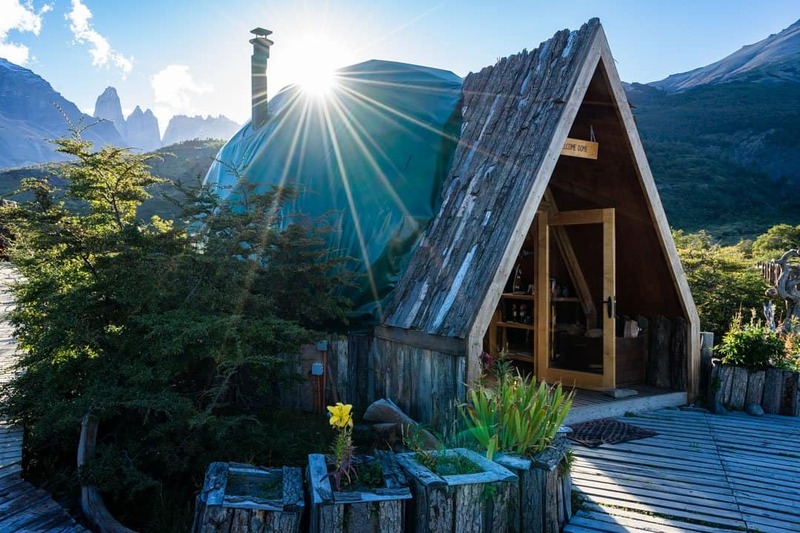 Hanging out at Chile’s best sustainable accommodation – EcoCamp Patagonia in Torres del Paine National Park. 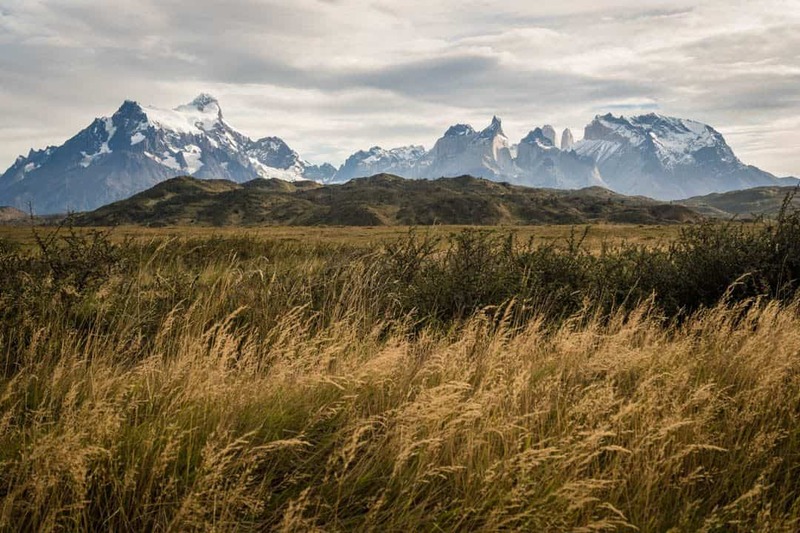 Patagonia is a region shrouded in so much beauty and character that it seems almost mythical. Sprawling desert crashes abruptly into jagged peaks, twisting rivers wind through pristine forest and ancient glaciers carve out a world that has attracted travellers for centuries. It was a destination we did not want to miss. 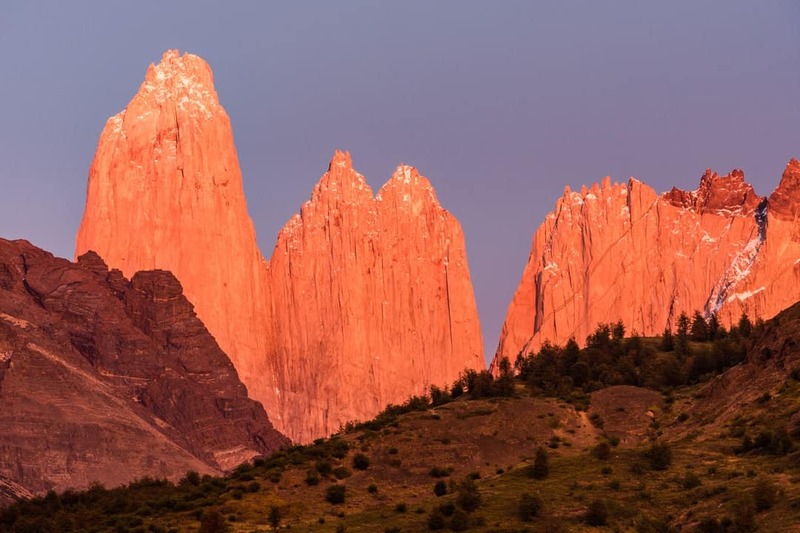 From the moment we started to draw up our plans to visit South America, Patagonia rose to the top of our list. Overlanding from Buenos Aires we ended our journey south in Ushuaia, otherwise known as the ‘end of the world‘. From there we crossed into Chile and started to make our way towards Puerto Natales and the nearby Torres del Paine National Park. This was going to be arguably the best stop in Patagonia. Known as the trekking capital of Chile, we knew we wanted to spend as much time as possible in the national park. After our 8-day trek on the O Circuit, we decided to head back into Torres del Paine for a few more days . 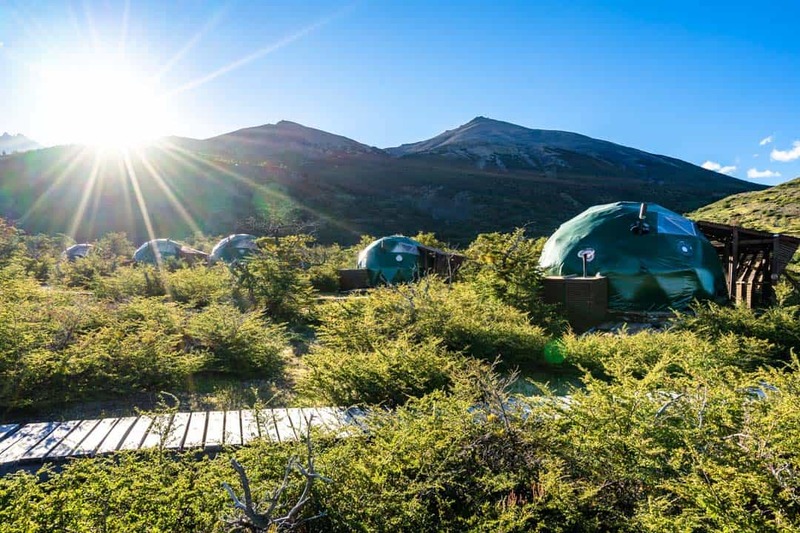 Rather than going back to camping (even though we love camping), we took an opportunity to stay at the famous EcoCamp Patagonia and their gorgeous, sustainable dome accommodation. These 4 days proved to be a real highlight of our travels, for more reasons than we ever expected. Don’t miss our ultimate guide on hiking in Patagonia. The Towers at sunrise, as seen from EcoCamp. EcoCamp offers transfers from Punta Arenas and Puerto Natales, and seeing as we were already in town we walked down to their office around lunchtime. Once the minivan had arrived with the other guests we headed to Aldea Restaurant for a delicious lunch. This place has quite the positive reputation in town and we were quite lucky to start off our trip with a meal there. Stomachs full we headed towards the national park, breaking up the 2-hour journey with a stopover at the Cueva del Milodon (the Milodon Cave). 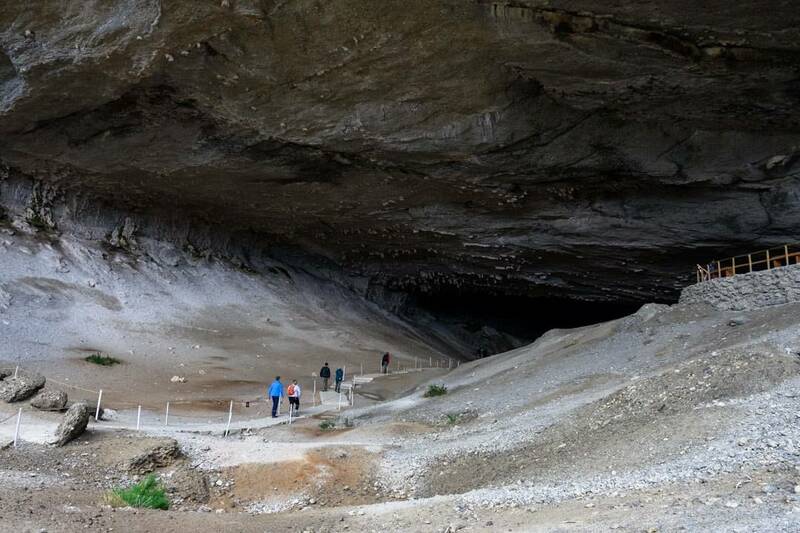 The now-extinct Milodon is the mascot for Puerto Natales, and it is in this cave that evidence of its existence was first discovered. The huge, sloth-like creature roamed the Patagonian steppe during the last Ice Age. Today a walking trail goes inside the vast, conglomerate rock cave, although most of the fossils have been removed. After the 45-minute leg stretch we jumped back in the van for the rest of the drive to Torres del Paine National Park. Hiking into the Cueva del Milodon. 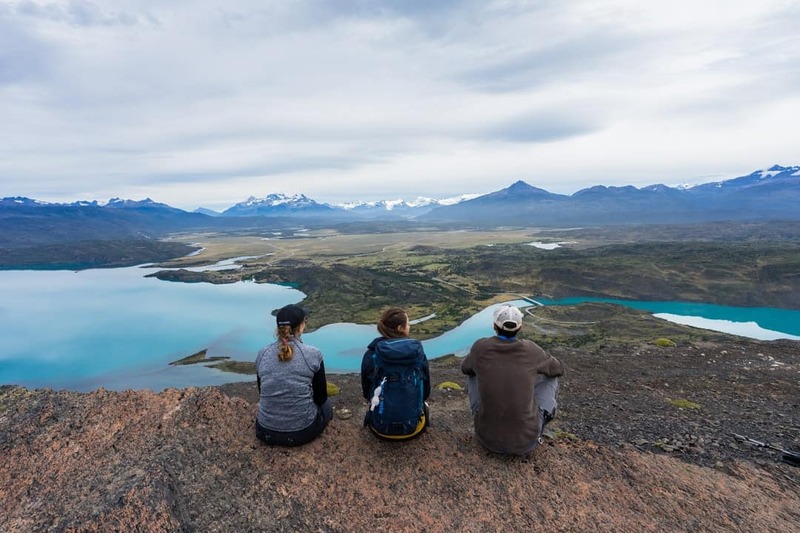 In a place as pristine, fragile and beautiful as Torres del Paine National Park, sustainable tourism should be everyone’s number one priority. After trekking around the O Circuit for 8 days, we saw first-hand just how spectacular this place is, and how important it is to maintain it for generations to come. The sprawling forests on the west side have already been the victim of tragic fires at the hands of careless individuals, and their charred skeletons will remain as a constant reminder of what can happen when things go wrong. 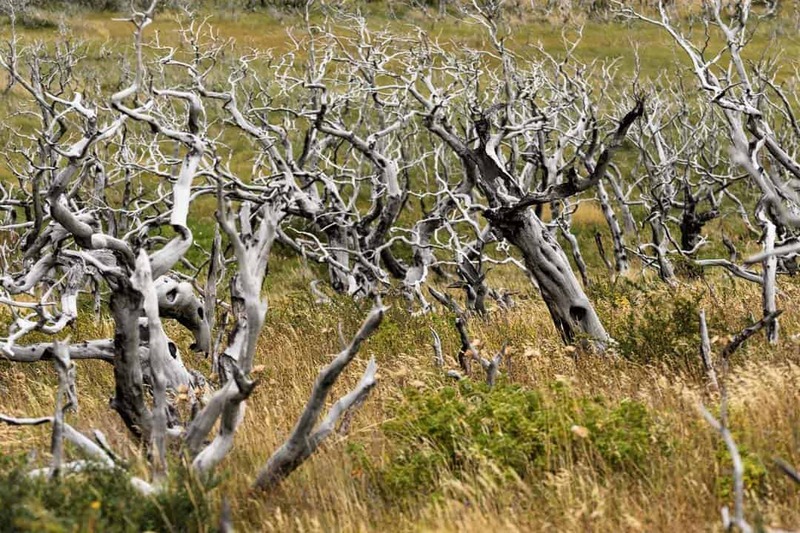 The burnt remains of a forest in Torres del Paine National Park. 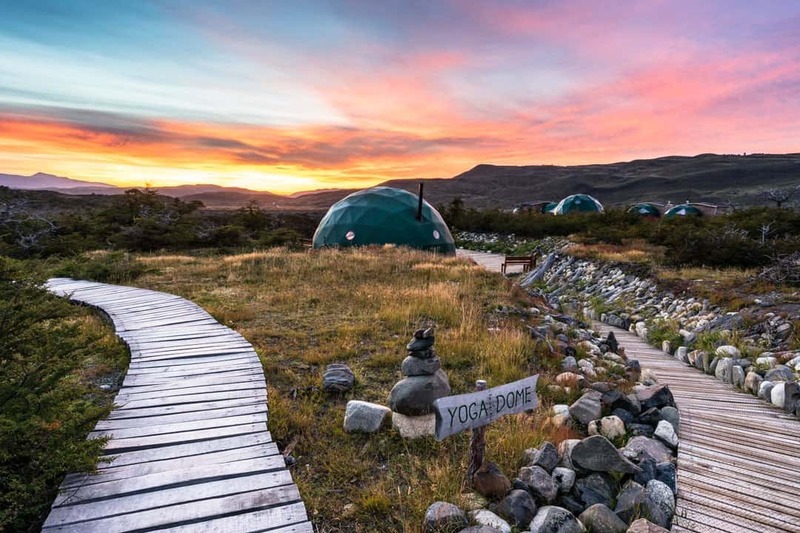 Located 7km from the main gate to Torres del Paine National Park, EcoCamp are doing everything they can to create a positive impression on both the landscape and the people who visit it. EcoCamp Patagonia is the brainchild of the founders of one of South America’s best adventure tourism companies, Cascada Expediciones. 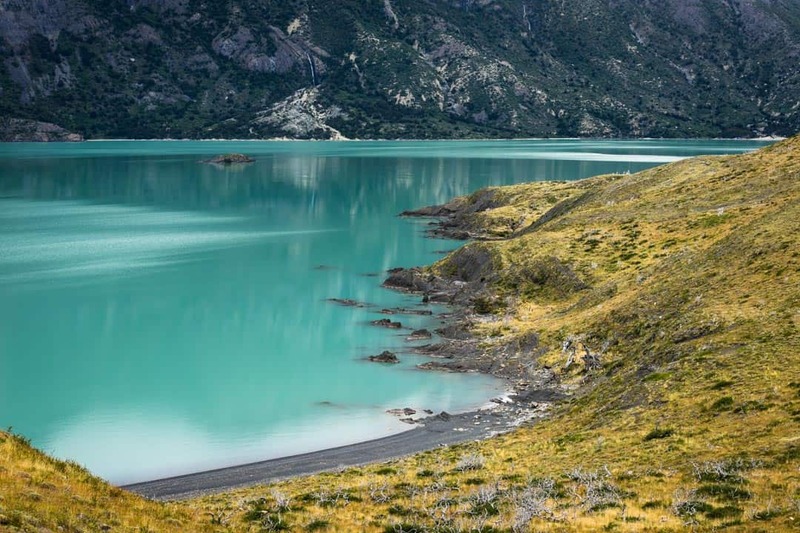 Having spent a lot of time in the park and seeing how susceptible it could be to mass tourism, the founders dedicated their time and effort into creating the first fully sustainable accommodation in all of Patagonia. After years of hard work, research and dedication, EcoCamp was born. Today the green domes at the bottom of the Paine Massif are an iconic symbol for responsible tourism in South America. The reception dome at EcoCamp. When we first started trekking the full circuit we walked past EcoCamp and fell in love with the green domes they had scattered around the place. We were desperate to see inside them, and now was our chance. Driving into the camp we were met by a few of the staff and shown to our dome. Not going to lie; we were very excited! The domes are modelled after the traditional dwellings of the indigenous Kaweskar people, who lived in the territory that the park now occupies. These spherical structures are incredibly resilient against strong winds (important for Patagonia!) and are designed to be constructed and dismantled without causing any harm to the earth. In other words, to leave no trace. For the first two nights we were lucky enough to be put in one of their suite domes, which are the creme-de-la-creme of EcoCamp. 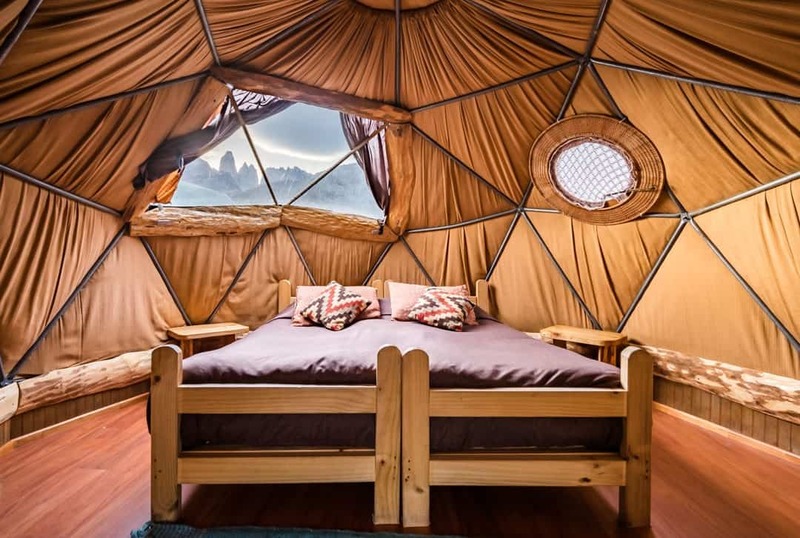 These large, beautifully decorated domes come complete with a sitting area, king size bed, a wood-fire stove, private bathroom and a gas heater. We had no idea that a simple dome could be so splendid on the inside. There was a huge plastic window that allowed us to look out at the forest and mountains, and having the fire roaring during the cold evenings was a real treat. For the second two nights we moved to one of their standard domes. But even though they are considered to be EcoCamp’s budget accommodation, we felt incredibly cosy in our little homes! Ever wanted to stay in a hobbit house? This is exactly what we felt like! We had to crouch to get through the pointed door, and once inside it opened up to have a huge comfortable bed and side beds. There was even a small window with a view of the towers, and we could star gaze from our bed at night. The standard domes don’t have heating or a private bathroom. Instead there is a large shared bathroom complex which in itself is quite luxurious. As for the heat, it was cosy enough that the domes were warm enough without them (and the blankets were very heavy and warm). Personally we felt like the standard domes were more than ample for most people. But if you want a bit more space or to feel like kings and queens in the best accommodation in Torres del Paine, don’t go past the suites! Inside our standard dome at EcoCamp. Once we were checked in we went for a walk around the rest of the grounds. The entire property is connected via timber boardwalks to minimise disturbance to the ground. Weaving in between the trees and shrubs helps keep the feeling of being in nature. Towards the back of the property is the Yoga Dome, where you can stretch out every morning and afternoon free of charge. 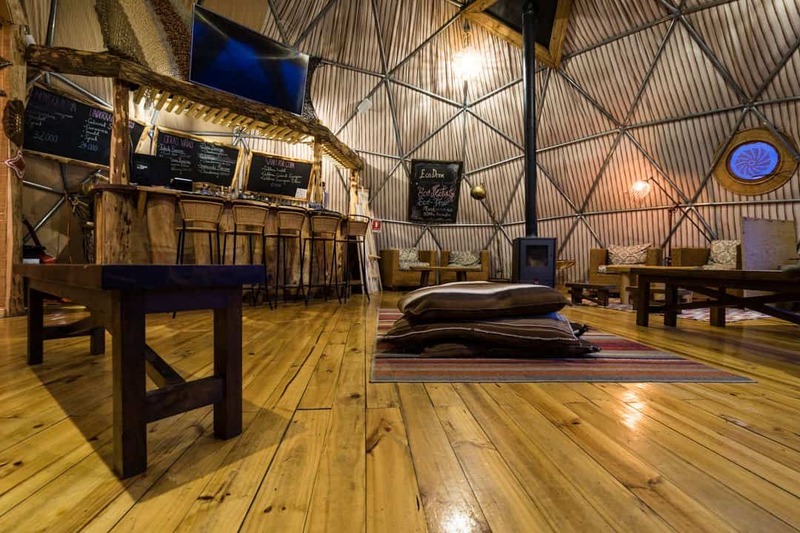 The “Yoga Dome” at EcoCamp. There were a few hanging chairs in various places as well, to grab a book and relax. The bar is where everything happens though! There’s a huge space with with comfy chairs, tables, books to read and some guitars to jam out on. Of course if you want to have a drink a staff member is always on hand to help you out with that. In the evenings this is where the briefings are for the next day’s activities, and delicious canapes and pisco sours are served up. When we had free time we mainly hung out on the deck outside though, which was a great place to soak up the sun (pisco sour in hand, of course). EcoCamp’s commitment to sustainable practices and responsible tourism is what makes them such a fantastic place, and the main reason we first were attracted to their accommodation. In this day and age, with more and more people travelling than ever before (which is a good thing), sustainable tourism is something everyone needs to consider. At EcoCamp it begins by protecting the fragile environment. 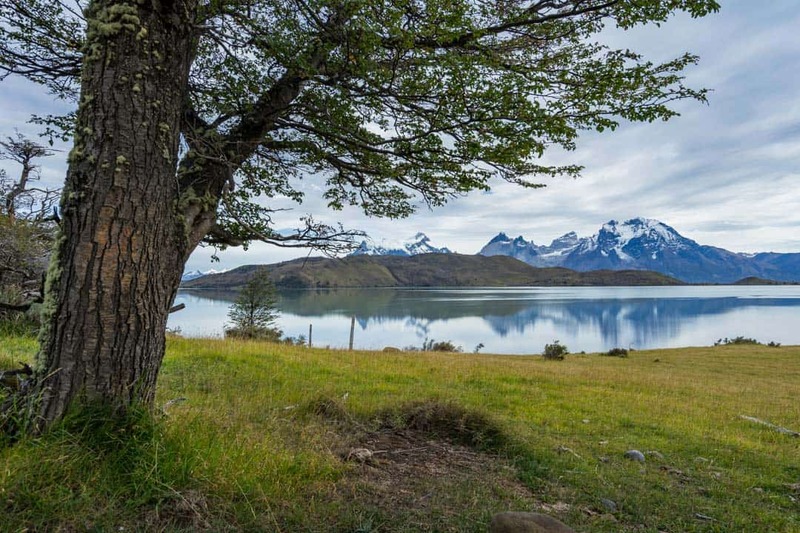 They were the first hotel in Chile, and the only hotel in Patagonia, to be given the internationally recognised ISO14001 and ISO9001 certifications. The very little energy that is consumed on the property comes from hydroelectric turbines and solar panels, with propane only being used to heat water and inside the suite domes. That being said guests are asked to only use electricity for charging laptops and cameras. Electric shavers, hair dryers and other items are prohibited (and seriously, you’re hiking every day…no one cares what your hair looks like). One thing that really interested us was their waste management procedures. They use composting toilets so as not to put any harmful sewage into the environment. They are also testing out the use of earthworms to clean the waste, and if all goes well this system will be implemented across the property next season. They have a strong commitment to recycling, and segregate all their trash appropriately to send off to recycling plants elsewhere in Chile. Besides that they have a ‘Leave No Trace’ policy, meaning that the entire camp is constructed to be able to be dismantled and removed while leaving an absolute minimal impact on the ground. 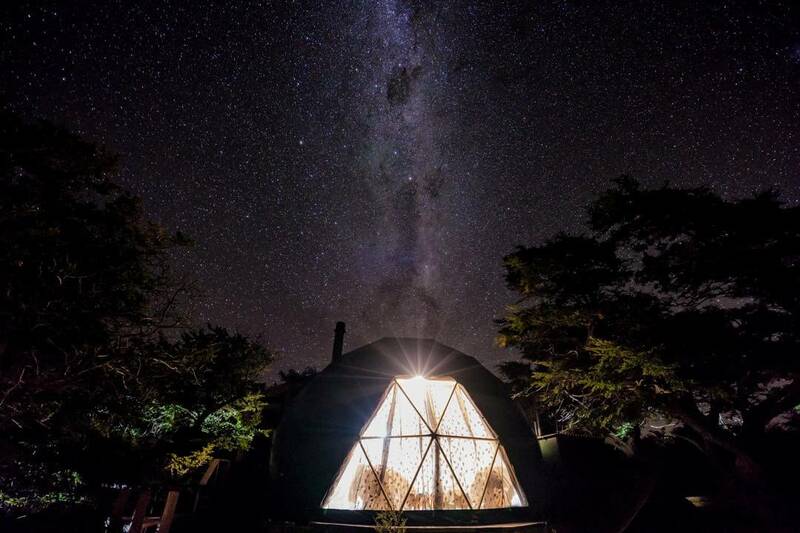 The Milky Way rising above our Suite Dome at EcoCamp. 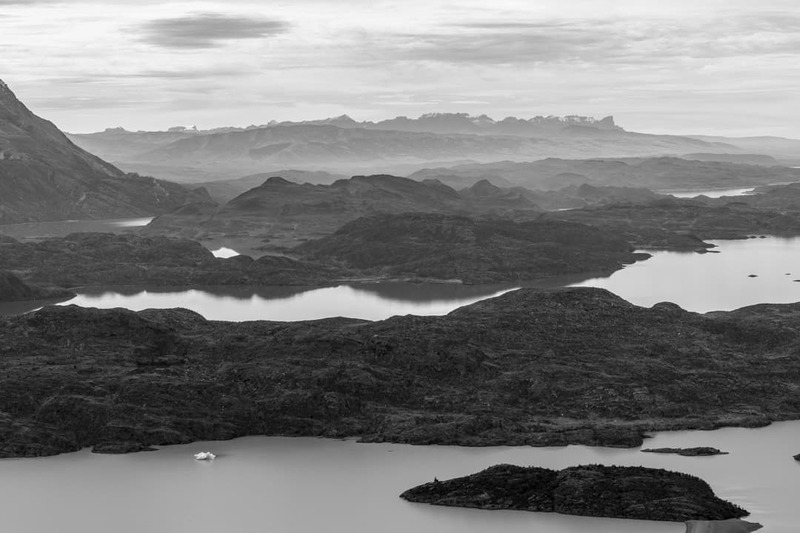 Minimising pollution helps to keep the skies this clear in Patagonia. When we were on the O Circuit we lived on crackers, salami, cereal with powdered milk, trail mix, rice and instant mash. While this is typical camping food, we have to admit that by day 8 we were pretty sick of it. We can promise you’ll never get sick of the food at EcoCamp. The team in the kitchen are all masters of creating culinary experiences, and every evening the meals was simply delectable. Each of the 3 courses came with three options, so whether you wanted meat, seafood or vegetarian, every base was covered. All of the food is locally sourced and, where possible, organic. This not only helps keep the quality of the food at the absolute top, but also supports the farmers in the area. Chilean wine is served with dinner, and the pours never seem to end. This was a nice surprise for us, but with all the activities we had to do every day we tried our hardest not to overindulge. Breakfast is served buffet style, and there is no shortage of options here either. The healthy options is what kept us happy, as breakfast in Chile isn’t exactly known for being the freshest. Lunches were make-it-yourself, with a big selection of meats, cheese, salads, vegetables, spreads, fruit and bread for sandwiches. The food is so amazing at EcoCamp, that it shouldn’t be a surprise if you go home a few kilos heavier. We didn’t get many photo of the food as we were too hungry at the end of every day. So here’s a nice photo from the Lazo Weber hike instead. Having already trekked the O Circuit, we were keen for a slightly more relaxed program at EcoCamp. It’s entirely possible to simply stay in some of the domes and do your own independent hikes and excursions, but we were ready for something different. 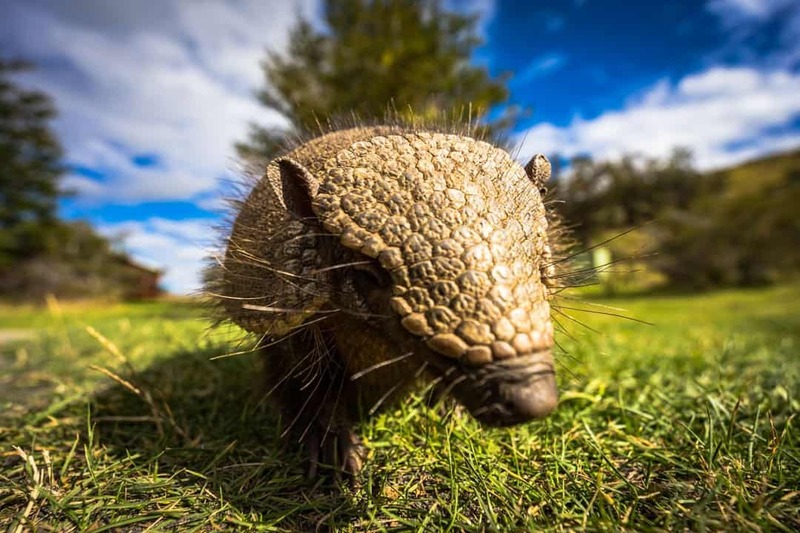 EcoCamp have a range of programs that are all-inclusive, meaning you get your accommodation, food, wine and guided excursions included as part of the package. While they have adventure programs with horse riding, kayaking and multi-day trekking, and offer opportunities to trek the W with them, we loved the sound of the Wildlife Safari. Don’t let the name fool you – this isn’t day after day of looking at birds or guanacos (although you will see birds and guanacos). Each morning you are given a choice of 3 activities, ranging in effort levels from easy, medium and difficult. Typically the difficult activities include a trek up the French Valley, or a mission to see the park’s most famous attraction, Los Torres. These leave early in the morning and don’t return til late at night. Having already visited these on our own, we opted for some different options. Gorgeous views of the Paine Massif. On our first we day opted for the easy hike, which took us to Laguna Azul. After the O Circuit we stoked to be able to get out to a section of the park we had missed during our 8 days. Leaving at about 9am we headed out in the minivan with our group and stopped off at a few viewpoints along the way. The sun was out, but the Patagonian wind was howling. Dust and sand kicked up and we quickly abandoned the photo stops. Once we arrived at Laguna Azul we jumped out and went for a mellow walk along the shore. Despite the wind the vistas were sensational, with the Paine Massif rising up in the distance, complete with clear views of the Towers, on the left while curious guanacos wandered around on the right. After 30 minutes we arrived at a small farmhouse and were greeted with an enormous spread of barbecued meat, salads and all-you-can-drink wine. We gorged ourselves then sluggishly went for another walk. The plan was to hike to the top of a hill for a great view, but the wind was so strong we ended up chilling by the lake. Laguna Azul was stunning, especially with that insane backdrop. A picnic table at Laguna Azul, with the towers in the background. No biggie. On this day Alesha and I decided to go separate ways. I wanted to climb to the viewpoint on Cerro Ferrier, which was classed as a ‘difficult’ hike, while Lesh liked the idea of the 14km hike through Lazo Weber with a higher chance of seeing wildlife. My group was split in two, with most people opting for the Grey Glacier boat ride. For the 4 of us remaining we hiked up the steep hill for a little over an hour to reach the sensational viewpoint at the top of the hill. Long views from the top of Cerro Ferrier. Afterwards we went the Administration building to enjoy some coffee, tea and snacks before taking a mellow walk to enjoy the views over the Western Lakes. Alesha’s day was just as enjoyable, and she had a great time soaking up the fresh air and chatting away with her small group and guide, Katty. She was even lucky enough to see the one thing everyone wants to see in Torres del Paine…a puma! It was quite a distance away so she unfortunately didn’t get a great shot. Afterwards we all met up again at EcoCamp for pisco sours and delicious food. A perfect way to end our second day. Loving the views on the Lazo Weber hike. On our last full day at EcoCamp we went for the easiest option again, as we had already been to the French Valley and Las Torres (the other two options). This was a very easy, 1-hour hike along flat ground to the Los Cuernos Mirador on the south side of the Lago Nordenskjold. Unfortunately for us it was quite overcast, so we couldn’t actually see ‘The Horns’. Still, having a few snacks while chilling by the lake was a welcome experience. 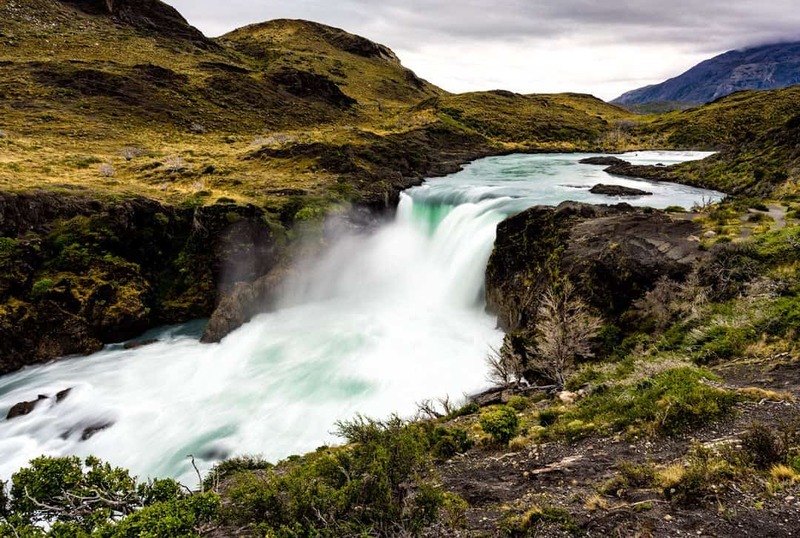 Once we had hiked back towards the van we took a detour to Salto Grande waterfall – a powerful torrent that charges from the Nordenskjold Lake. We headed off to the Pehoe campground to enjoy our lunch and drink some mate. While we were there we were lucky enough to see a fox and an armadillo wandering around, and we managed to get some great photos of them! At this point we were asked if wanted to go on another hike, but after a quick chat we decided to head back to EcoCamp to make the most of the afternoon. This is the great thing about being on one of these programs – essentially it is up to you to determine how far, short, fast or slow you go. Before we knew it we were sitting back outside EcoCamp, sipping on a herbal tea and playing guitar in the sun out on the deck. We were pretty sad to be leaving EcoCamp so soon, and wish we had more time to simply relax and soak up the ambiance. 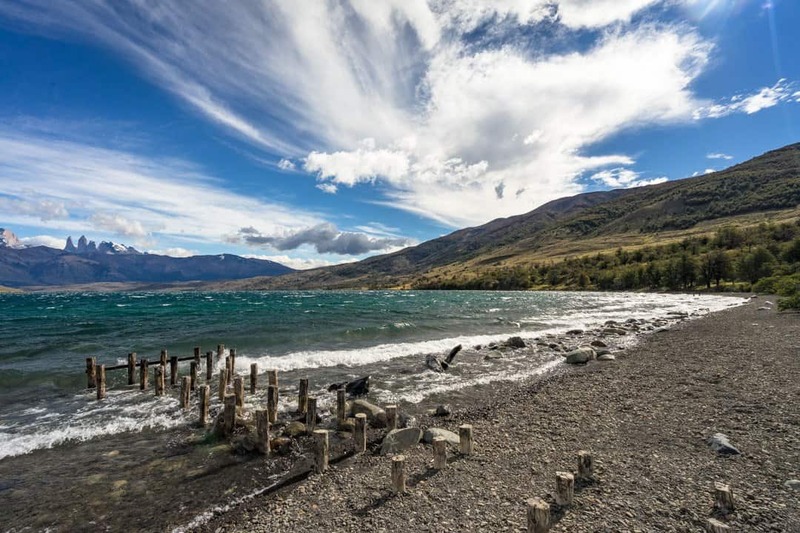 In the morning we jumped back in the van and headed towards Puerto Natales, where we would spend a couple of days catching up on work and getting ready for the next adventure. Staying at EcoCamp was honestly an experience that will stay with us for years to come. We’ve been lucky enough to visit many different sustainable accommodations around the world, and seeing first hand what the staff at EcoCamp is achieving was inspiring. 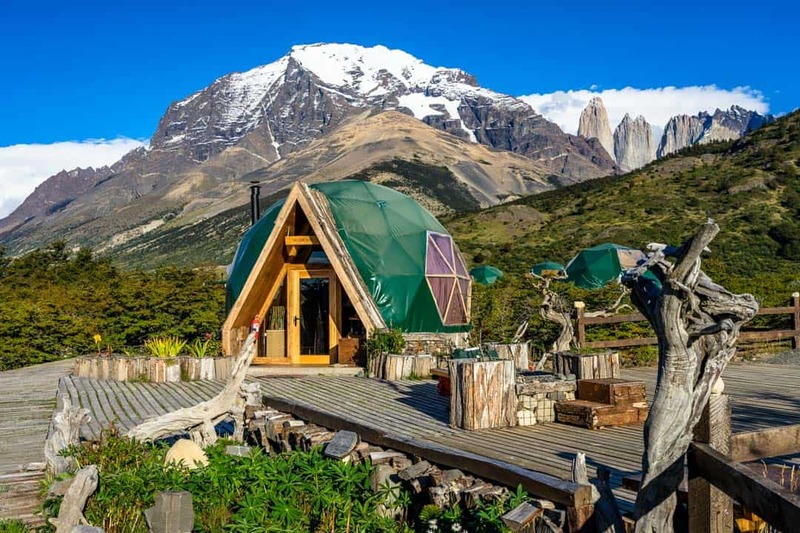 If caring about the environment while going on amazing adventures is something that interests you, or you are just interested in learning more about how to implement responsible practices into the household, definitely don’t miss EcoCamp Patagonia at Torres del Paine National Park in Chile. Just for fun, here’s that armadillo we saw at Camp Pehoe! We were graciously hosted by the crew at EcoCamp to experience their sustainable accommodation and wildlife safari. All thoughts, opinions and copious glasses of wine consumed are, as always, our own. So cool guys! We head down to EcoCamp on the 11th and can’t wait – you’ve got us even more excited now!! So glad you are staying there Sarah. It is so magical. Hope you had a magnificent time. 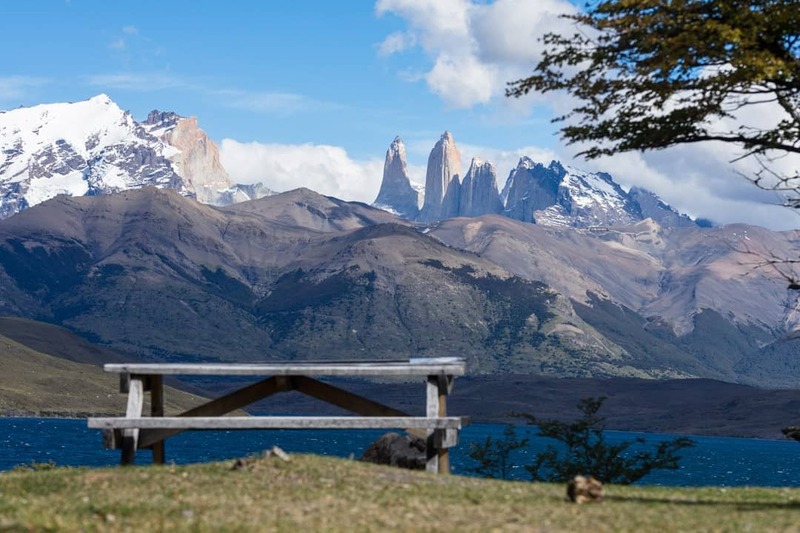 This post has got me so excited for visiting Torres del Paine. We’re hoping to volunteer there. With a bit of luck we’ll get to stay at the Eco Camp! The yoga dome looks amazing and knowing that the food and wine is great makes it even better! Was it expensive for a couple to stay there?